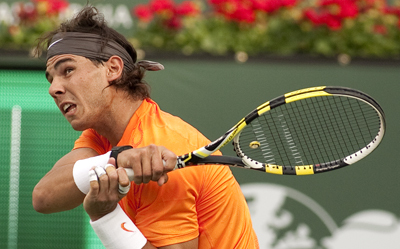 Rafa says hard courts are too hard on the body. INDIAN WELLS- Former Indian Wells champion Rafael Nadal, who has won just about every significant hard court title in the book, is no longer a fan of playing on softened concrete. On Saturday at Indian Wells, he won his first match on hard courts in nearly a year with a 7-6 (3), 6-2 victory over Ryan Harrison, who actually played as well as he has since Sydney. But nonetheless, Nadal won the big points, dictated when he had to and their were only a few moments when it looked like he might be in trouble. Harrison mixed up his attack nicely, and tried to make the net his best friend, but Nadal passes like a monster and unless Harrison hit outstanding approach shots, the Spaniard whizzed balls by him. As Nadal said, he played well enough to win, which means getting ball in the center of the court and yanking his foe around until he can run no more. His depth was decent, his power was substantial, and perhaps most importantly , he didn’t think that much about his knees. There were those during the Latin America clay court swing who said that he wouldn’t play Indian Wells, that he would not attempt to play on hard courts, but they were wrong and he did and while he cannot be called a favorite in this tournament, that he was able to handily beat Harrison and not come off the court aching means he is likely is good to go for at least a few matches.